Ahi Evran University, College of Health Department of Nursing KIRŞEHIR Introduction: Intimate partner violence is a global public health problem that causes physical, sexual and psychological harm to elderly women. Materials and Method: The present qualitative study was conducted on 8 elderly women living at a nursing home, who were the victims of IPV in the past. The aim of the current study was to reveal the health consequences of their experiences of intimate partner violence, its risk factors and their coping strategies. Focus group interview method was used in our study. Qualitative content analysis method was employed as a data analysis method. Results: In the focus group interviews, it was observed that elder women were mostly exposed to physical, verbal, emotional violence and that they generally decided to remain silent against the violence, showed patience, took refuge in God, and they were affected psychologically in the long term. 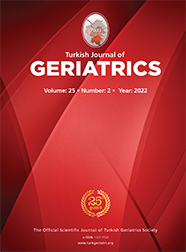 Marriage at a young age, economic status, gender roles, and traditional structure, religious believes and values appear as significant risk factors for intimate partner violence in elderly women.